Christmas is just around the corner (yay!! I am SOO excited!! 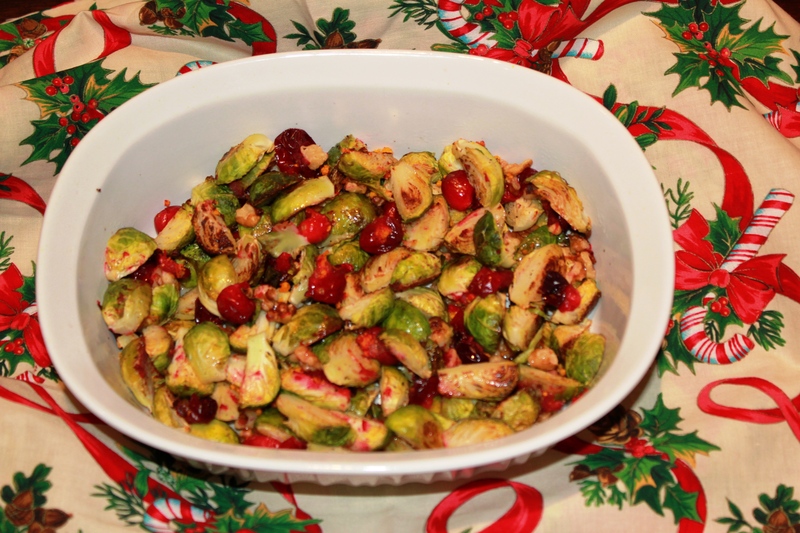 ), and whether you celebrate or not, you’ll want to try this easy, nutrient-packed, and delicious side dish. There aren’t too many dishes that look just as festive as they taste, but this one does! The simple flavors come together so well – the tart cranberries are balanced out by the sweet maple syrup, the buttery walnuts, and the hint of acidity from the orange zest and apple cider vinegar. I first made this two years ago for my family Christmas, and it was a great way to add some veggies (and color!) to the table without sacrificing flavor. It fits in great with a standard holiday meal, but I have to say I enjoyed this just as much as a side for a “regular” meal last weekend! 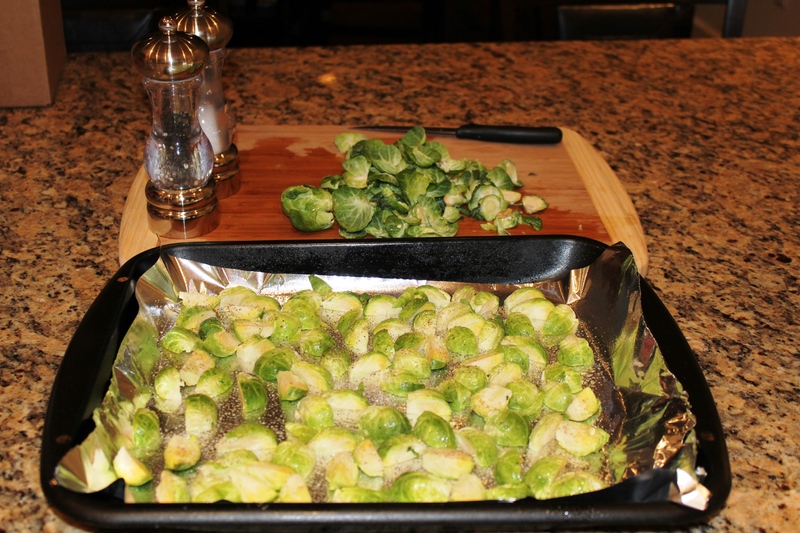 Remove the bottom piece of the stem of each Brussels sprout, and remove a few of the outer leaves. 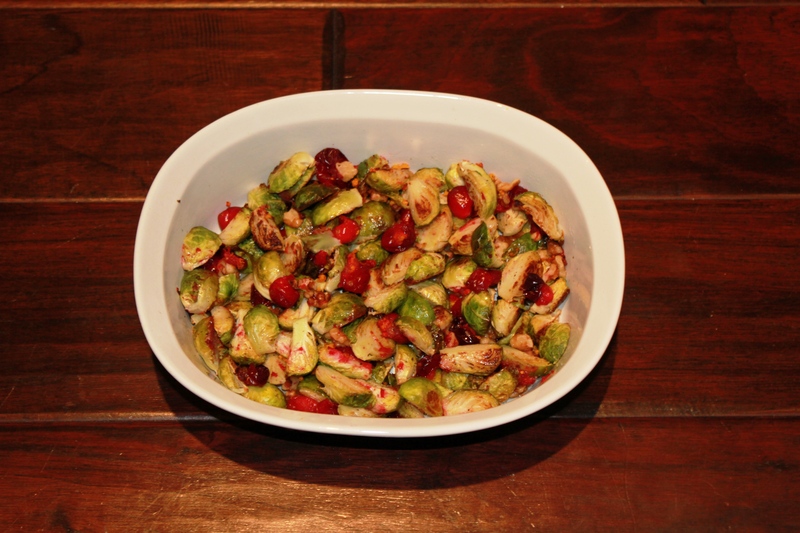 Chop Brussels sprouts in half or quarters, depending on their size. 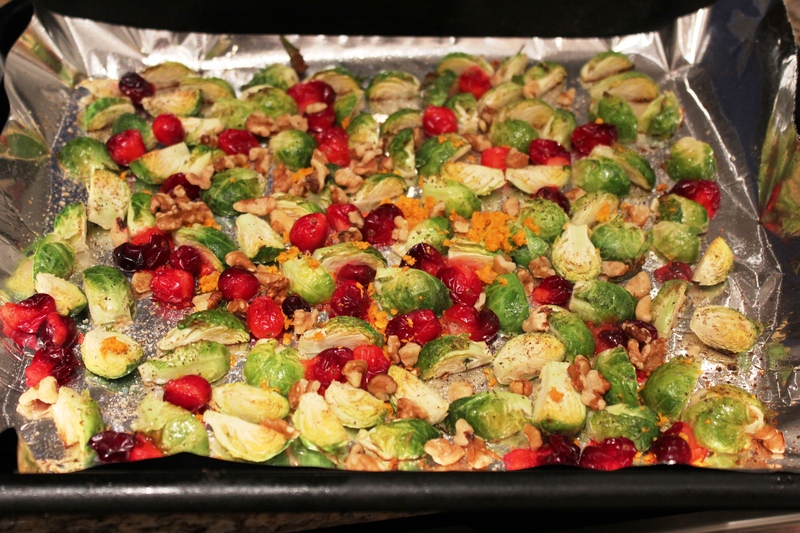 Lay chopped Brussels sprouts on a baking sheet lined with foil and sprayed with cooking spray. Spray cooking spray (or olive oil) on top of the Brussels sprouts, and sprinkle with salt and pepper. Put in oven for 10 minutes. 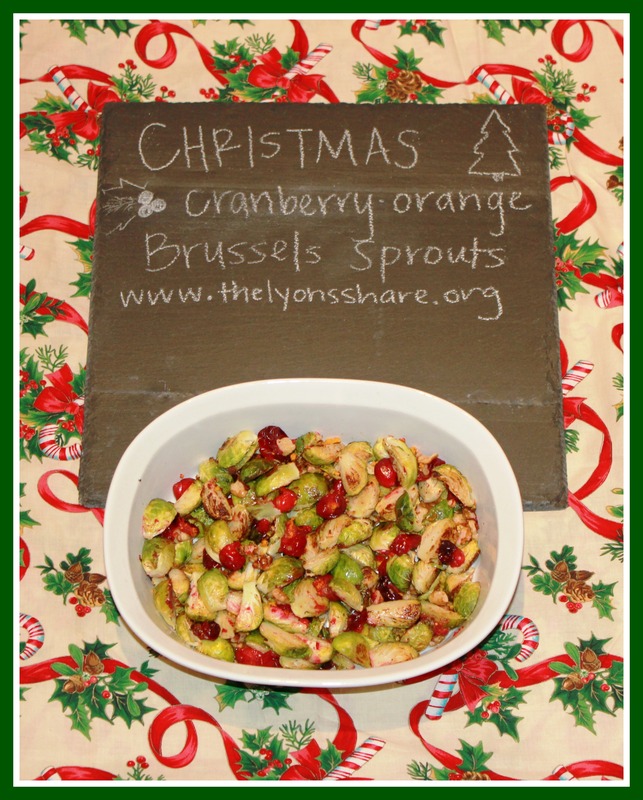 Remove pan, and sprinkle cranberries on top of Brussels sprouts. 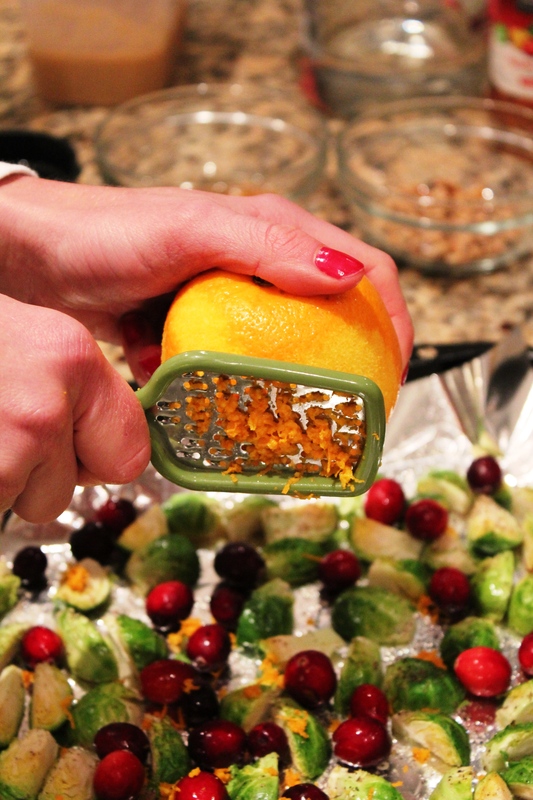 Zest one orange on top of sprouts and cranberries. Return to oven for 7 minutes. Sprinkle walnuts on pan, and return to oven for 3 more minutes (20 minutes total). Meanwhile, whisk together maple syrup and apple cider vinegar. 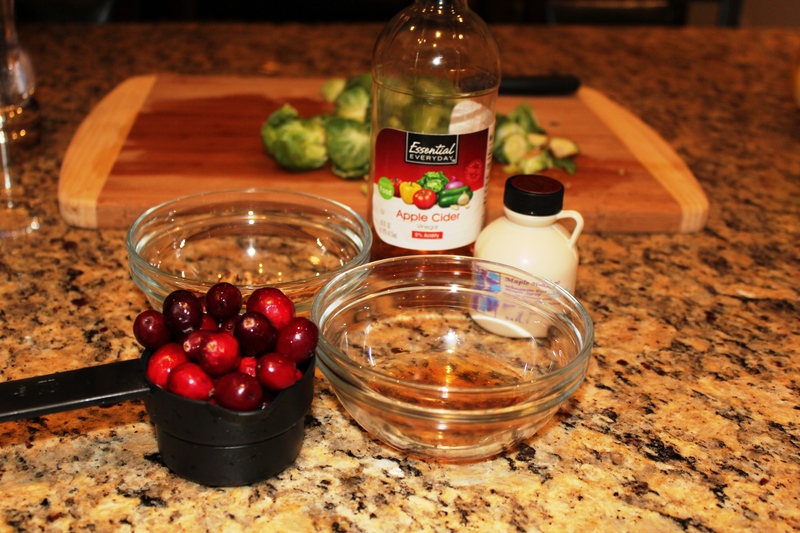 When Brussels sprouts are finished cooking, place in serving dish and drizzle syrup mixture on top. If made according to this recipe (for 3 servings), each serving will have 131 calories, 5g fat, 15g carbs, and 6g protein. 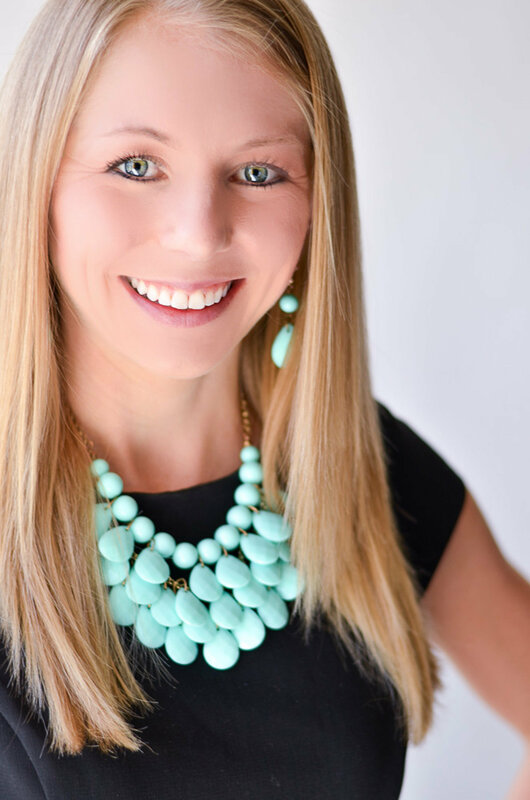 You are the Brussels sprouts QUEEN! Favorite holiday side dish is actually hashbrowns. We always eat them for breakfast on Christmas, and I look forward to them all year. I can’t seem to cook them as well as my fam can! Hope you loved your hashbrowns!!! Yikes, it seems to be a popular flavor combo! Ever since I’ve made it, I keep noticing it popping up everywhere! Thanks for the Christmas wishes! It was amazing! The minute brusselS sprouts goes down in price ($11.99 a kilo…) I will be giving this a go- Brussels were voted the most hated vegetable in Australia. Fail. Favourite holiday dish is this Summer potato salad- mixed with gherkins, mayo, salt and pepper. So simple yet so good! I am just NOT a potato salad girl. Have never really gotten into it. But two things just made me smile – thinking about summer dishes for Christmas, AND the word “gherkins” … such a strange one! Pomengranates are another great red food! But this looks delicious. I can never get through a whole recipe that Lisa could have, huh? You guys must be the masters at food substitutions!